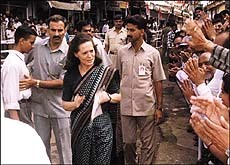 PACHMARHI (MP), Sept 6  The Congress President, Mrs Sonia Gandhi, today declared coalitions as a passing phase, equated their emergence to the decline of the party and promised to make a comeback with "full force and on our own steam". BADEN BADEN, Sept 6  Germany is likely to press India to sign the Comprehensive Test Ban Treaty and the Nuclear Non-proliferation Treaty unconditionally during talks between its leaders and President K.R. Narayanan who arrived here today on a five-day visit to Europe. SHIMLA, Sept 6  At least 12 persons were killed and 35 injured, 10 of them seriously, when a Himachal Road Transport Corporation bus plunged into a 250-ft deep khud at Gallu, 20 km from here, today. CHANDIGARH, Sept 6  The Punjab government today placed Mr Bhushan Kumar Garg, Senior Superintendent of Police, Moga, and Mr Surinder Singh Sandhu, DSP (Rural), Moga, under suspension. ISLAMABAD, Sept 6  Seven opposition parties, including Ms Benazir Bhuttos Pakistan Peoples Party and the Awami National Party, have formed a grand alliance which will oppose the proposed Islamisation Bill both inside and outside Pakistani Parliament. CHHAPAR, Sept 6  The Punjab Bhalai Manch, an organisation floated by Mr Balwant Singh Ramoowalia, MP, will be transformed into a political party. CHHAPAR, Sept 6  Top Akali leadership today fired a broadside against the Congress and Mr Balwant Singh Ramoowalia.